Below are samples of papers and other research publications divided by topic area. 1. Editor in Chief for the American Journal of Science and Engineering. 2. Reviewer for scientific papers submitted to IEEE Security & Privacy and IEEE Open Access. 6. Member of IEEE Software & Systems Engineering Standards Committee. Working on the DevOps working group. 7. Editorial board member for the year 2016 for Journal of Information Security Science & Digital Forensics. This is an international peer reviewed information security journal. 8. Editorial board for the year 2016 member for The Forensic Examiner. At the 2018 Annual IEEE 8th Annual Computing and Communication Conference at the University of Nevada in Las Vegas, Dr. Easttom chaired a session on Artificial Intelligence, and another session on Computer Architecture and VLSI. 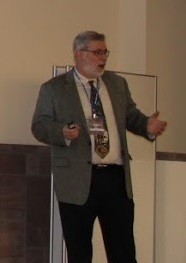 Dr. Easttom was a keynote speaker presenting a talk on "The impact of complexity and emergent properties on engineering". He also chaired a session on "IOT, Robotics and Machine Vision" as well as a session on "Mobile and Wireless Communication, Network". Dr. Easttom is on the technical committee for "Wireless & Sensor Networks & Cybersecurity; Mobile Computing and Security" IEEE IEMCON 2019 Conference. Dr. Easttom is on the technical committee for "Wireless & Sensor Networks & Cybersecurity; Mobile Computing and Security" IEEE Ubiquitous Computing, Electronics & Mobile Communications Conference (UEMCON) 2019 Conference. Easttom, C. (2019). "An Analysis of Leading Lattice-Based Asymmetric Cryptographic Primitives". 2019 IEEE 9th Annual Computing and Communication Conference. Presentation on "Quantum Computing and Cryptography" October 10th and 11th, 2018 SecureWorld Dallas 2018. "An exploration of quantum computing and post quantum cryptography" October 8 to 10 ISC2 Security Congress in New Orleans. Presentation on "Quantum Computing and Cryptography" May 17, 2018. SecureWorld Houston 2018. Presentation on "Quantum Computing and Lattice Based Cryptography" April 11, 2018 University of Texas at Dallas ACM chapter as part of the Distinguished Speakers of the ACM program. Easttom, C. (2018) An Overview of Cryptographic Backdoors. Journal of Information System Security, 13 (3), 177-185. Easttom, C. (2018, May). An Examination of Inefficiencies in Key Dependent Variations of the Rijndael S-Box. In Electrical Engineering (ICEE), Iranian Conference on (pp. 1658-1663). IEEE. Easttom, C. (2018, May). A Study of Cryptographic Backdoors in Cryptographic Primitives. In Electrical Engineering (ICEE), Iranian Conference on (pp. 1664-1669). IEEE. Easttom, C. (2018). A Generalized Methodology for Designing Non-Linear Elements in Symmetric Cryptographic Primitives. In Computing and Communication Workshop and Conference (CCWC), 2018 IEEE 8th Annual. IEEE. Easttom, C. (2017). An Overview of Quantum Cryptography with Lattice Based Cryptography. IOSR Journal of Mathematics, 13(6). Easttom, C. (2016). Cryptographic Backdoors - An Introduction. Journal of Information Security Science and Digital Forensics 1 (1). Easttom, C. (2015). Modern Cryptography: Applied Mathematics for Encryption and Information Security. New York City, New York: McGraw-Hill Publishing. Easttom, C. (2010). RSA and its Challenges. EC Council White Paper. Easttom, C. (2011). The RSA Algorithm - The ups and Downs. CryptoMagazine. Easttom, C. (2011). Feistel Ciphers - An Overview. Presentation at Cast Security Conference. Washington, D.C.
Easttom, C. (2012). Problems with RSA. Presentation at Takedown Security Conference � Dallas, TX. Easttom, C. (2014). Cryptographic Backdoors. Presentation at ISC2 Security Congress. Atlanta, Georgia. Easttom, C. (2018). How to model digital forensics investigations with graph theory. Digital Forensics Magazine, 37. Easttom, C. (2018). "A Systems Approach To Indicators Of Compromise Utilizing Graph Theory". 2018 IEEE International Symposium on Technologies for Homeland Security. Presenting "Applying Graph Theory to Digital Forensics" 6 May 2018 Princess Sumaya University for Technology in Amman Jordan as part of the Distinguished Speakers of the ACM program. Easttom, C. (2016). Multi-Dimensional Analysis for Cyber Investigations. Forensic Examiner Journal,25 (4). Easttom, C. (2016). Applying Graph Theory to Evidence Evaluation. Research Gate DOI: RG.2.2.23391.0528. Easttom, C. (2017). Utilizing Graph Theory to Model Forensic Examination. International Journal of Innovative Research in Information Security (IJIRIS), 4(2). Easttom, C. (2016). Secure World Dallas. Speaking on "Analyzing Forensic Evidence -Applications of graph theory to forensic analysis�. Easttom, C. (2017). University of North Texas. A presentation on Applying Graph Theory to Analyzing Digital Evidence. Easttom, C. (2017). Enfuse 2017 conference in Las Vegas. A presentation on Applying Graph Theory to Analyzing Digital Evidence. Easttom, C. (2017). ISC2 Security Congress in Austin Texas. A presentation on "Applying Graph Theory to Analyzing Digital Evidence". Easttom, C. (2017). 2nd International Congress of the International Association of Law and Forensic Science (IALFS), in Cairo Egypt January 17, 18, 19. �Applying Graph Theory to Model Forensic Examinations�. Easttom, C. (2018). A Method For Using Historical GPS Phone Records. Digital Forensics Magazine, 36. Easttom, C. (2018). The Daubert Standard as a Framework for Digital Forensics. Digital Forensics Magazine, 35. Easttom, C. (2017). American Academy of Forensic Sciences 69th Annual Meeting. Speaking on a novel approach JTAG phone forensics. Easttom, C. (2017). 2nd International Congress of the International Association of Law and Forensic Science (IALFS), in Cairo Egypt January 17, 18, 19. The topics were �Improving Digital Forensics� and �Applying Graph Theory to Model Forensic Examinations�. Easttom, C. (2016). Secure World Dallas. A presentation on "Analyzing Forensic Evidence -Applications of graph theory to forensic analysis�. Easttom, C. (2016).Jordan Cyber Security & Forensics Forum (JCSFF-2016) Presenting two presentations. The topics were �Zero Day Exploits� and �How to forensically analyze Zero Day Exploits�. Easttom, C. (2016).�Improving Professional Standards in Cyber Forensics� Keynote speaker for Association of Digital Forensics Security and Law. Easttom, C. (2019). "A Modified McCumber Cube as a Basis for a Taxonomy of Cyber Attack". 2019 IEEE 9th Annual Computing and Communication Conference. Easttom, C. (2019). " Conducting Investigations on the Dark Web". Journal of Information Warfare 18 (1). Easttom (2018). An Examination of the Operational Requirements of Weaponized Malware. Journal of Information Warfare 17 (2). Easttom, C. (2018). The role of weaponized malware in cyber conflict and espionage. In 13th International Conference on Cyber Warfare and Security ICCWS, 2018. Easttom, C. (2018). Bluetooth Hacking 101. 2600 Magazine 35(1). Easttom, C. (2017). Enhancing SQL Injection With Stored Procedures. 2600 Magazine. 34(3). Easttom, C. (2016). Spyware Techniques. 2600 Magazine. 33(3). US Patent 10,122,573 Managing a network element operating on a network. US Patent 10,242,188 Method and apparatus of performing data executable integrity verification.